PNC, The Cincinnati Reds and Players For The Planet are joining forces again with Cohen Recycling and many of Cincinnati’s leading corporations for the 4th annual PNC/Players For The Planet E-Waste Recycling Drives on April 19-21, 2013. 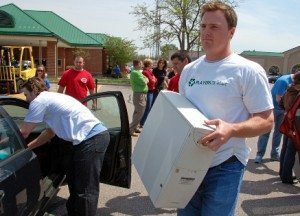 The PNC/Players For The Planet E-Waste Recycling Drives provide an easy way for Reds fans and residents of Greater Cincinnati and Northern Kentucky to recycle old electronics. The public is encouraged to visit four convenient locations with their electronic waste items for recycling, click here for flyer and location information. TODAY, Friday, April 19th from 7 a.m. to 5 p.m.
Players For The Planet will accept televisions, radios, VCRs, computer monitors, personal computers, hard drives and many other electronics. For a full list of acceptable items, please visit: www.cohenusa.com/reds. A donation of $10 per car is suggested to offset the recycling costs. The first 200 cars at each event will receive two View Level tickets to an upcoming 2013 regular season Reds game, while supplies last. Cintas file and paper shredding services will be on-site on Friday and Sunday. « Come one, come all, it’s time for our Spring Litter Cleanup Event!